Take a stroll down the over-the-counter medicine aisle of any drugstore, and you'll undoubtedly be presented with a myriad of remedies for gastrointestinal issues. Gas, bloating, constipation — they're all common ailments with their designated drugstore antidotes. But while traditional Western remedies, such as simethicone (the main ingredient in Gas-X) and loperamide (the main ingredient in Imodium), have proven track records for being effective, they're not for everyone, particularly those with a more holistic lifestyle. Looking to banish bloat, gas, and/or constipation, but want to keep it natural? Your remedy may lie in the tea aisle. As is the case with many gastrointestinal discomforts, gas is caused, in part, by food. According to the National Institute of Diabetes and Digestive and Kidney Diseases, gas happens when food isn't digested by the small intestine and is instead broken down by bacteria in the large intestine. Foods with a high-fiber content, such as legumes, fruits, vegetables and whole grains, tend to cause more gas. Swallowing excessive air is another flatulence- or belch-causing culprit that's often caused by chewing gum, talking while eating or using a straw. Additionally, lactose intolerance or, more seriously, celiac disease can be the underlying issue of gas. 1. Peppermint Tea: As far as gas-combating teas go, peppermint is usually the first line of defense. "Peppermint tea is a great digestive aid, since it helps increase bile secretion and encourage bile flow, which can help to speed and ease digestion," says Jenn Keirstead, a registered holistic nutritionist at Mountain Trek wellness resort in British Columbia. The healing compounds in peppermint, as well as the property that gives it it's unmistakable smell, is menthol and menthone. A 2006 study from Phytotherapy Research found that, in addition to having antimicrobial and antiviral activities, peppermint can be helpful in soothing GI conditions, including gas, bloating and irritable bowel syndrome (IBS). 2. Lemon Balm Tea: Lemon balm is another member of the mint family and, like peppermint, contains healing properties that can be helpful for gas. The main active compound in lemon balm is eugenol, which aids in numbing pain and easing muscle spasms in the digestive tract, which, in turn, creates a less friendly environment for gas. 3. Chamomile Tea: "Chamomile tea is gentle, calming and has anti-inflammatory properties, which makes it excellent for easing the discomforts of gas and bloating," says Keirstead. But if you're using chamomile tea for gas, it's important to note that there are two kinds — Roman and German. Most research on the effects chamomile has on intestinal gas and other digestive issues has been done on the latter, but a 2011 study from the Journal of Applied Pharmaceutical Science found that Roman chamomile contains chemicals that can reduce flatulence, as well. 4. Fennel Seed Tea: Fennel seed is a known carminative that helps promote gentle digestion. "It can help relax the muscles of the gastrointestinal system, which reduces gas and bloating, as well as stomach cramps," Keirstead says. Fennel is also mixed with sodium bicarbonate, anise seed and dill to make gripe water, a natural medicine used to treat colic and flatulence in infants. Anyone who's ever had a bloated stomach knows the uncomfortable feeling — a full, tight belly that's sometimes coupled with abdominal pain. A variety of things can cause bloating, but it's almost always the result of trapped gas that hasn't been able to pass through via flatulence or belching. Eating too fast, eating fatty foods, smoking, anxiety, and stress can all be the root cause of bloating. 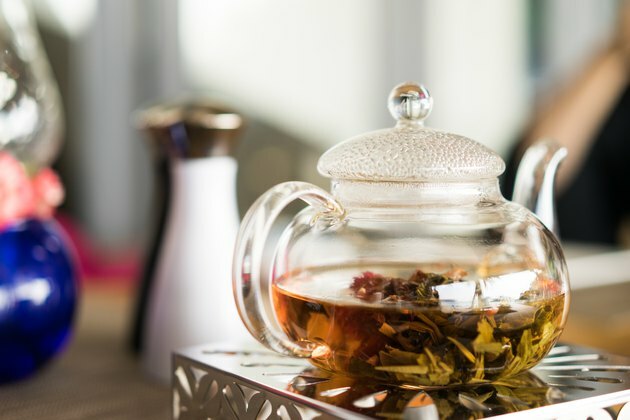 Of course, the best way to beat bloat is to avoid known culprits in the first place, but once it's too late, finding a good tea for bloating is key. Read more: Does Chamomile Tea Help With Bloating and Trapped Gas? 2. Hibiscus Tea: A 2013 study from the University of Arizona found that hibiscus has flavonoid compounds in it to help regulate aldosterone, which is the hormone responsible for regulating the absorption or release of water in the kidneys. In other words, it can help decrease bloating and water retention. 3. Dandelion Tea: Made from the root and/or leaves of spring's ever-present pest, dandelion tea, which is chock full of vitamins A, C, and D, packs impressive diuretic properties. A 2009 study published in the Journal of Alternative and Complementary Medicine found that after two doses of dandelion tea, participants showed a significant increase in frequency of urination, and in turn, bloating subsided. Occasional constipation, which the Mayo Clinic describes as occurring with fewer than three bowel movements a week, isn't uncommon, but nevertheless, it's uncomfortable. Constipation often occurs when waste moves through the digestive tract too slowly or cannot be eliminated at all. 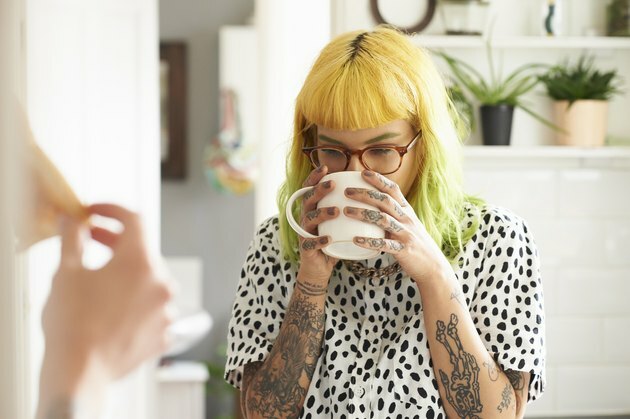 Drinking lots of water, exercising, and eating healthy, fiber-rich foods can all help with occasional constipation, but to help jumpstart your system, tea for constipation can be effective. 1. Senna Tea: Senna, which is made from the dried leaves and pods of the senna alexandrina shrub, is among the most well-known and frequently used laxative ingredients in teas, as it contains compounds called glycosides which stimulate the digestive system. Senna is one of the main ingredients in the popular Smooth Move tea, which is often recommended by Keirstead at Mountain Trek when clients are experiencing constipation or slow digestion. "However, it's only recommended for the overnight relief of occasional constipation," Keirstead says. "Long-term use of laxative-stimulating teas is never advised." Keirstead also doesn't recommend senna leaf tea for anyone who has diarrhea, stomach pains or gas. 2. Marshmallow Root Tea: Marshmallow root contains mucilage, which coats both the respiratory and digestive tract, aiding in a variety of conditions, including heartburn, diarrhea, stomach and intestinal ulcers and constipation.